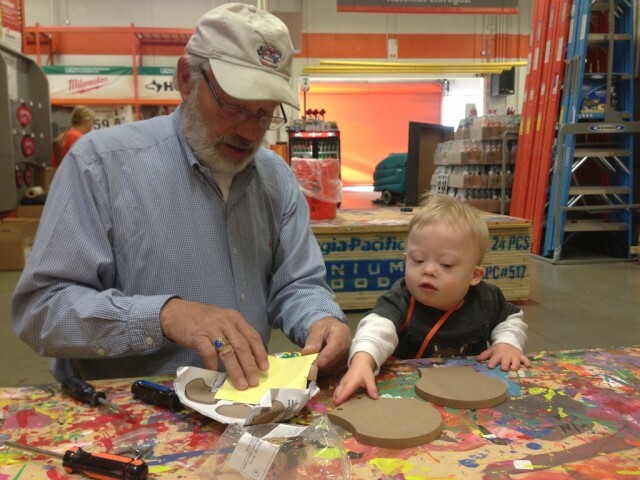 The Free Kid's Workshops At Home Depot Are Awesome! There are lots of awesome things to say about Home Depot. 1. They let you throw free kids birthday parties! 2. They sell lots of fun toys, like this. 3. They have free weekend kid workshops every weekend! Since Noah’s grandpa was in town this weekend, I thought it would be fun to take them to Home Depot early on a Saturday morning to have a little free fun. Click play on the video below to see what “Noah” got to build. Here’s a few pictures from our morning. 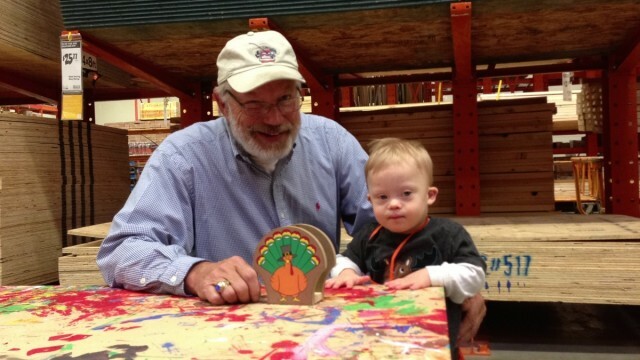 Have you ever been to any of the kid’s workshop’s at Home Depot? If so, how did you kid’s enjoy it? I’ll admit that I’ve been. Who wouldn’t go with their kids to something like this for free? But I’d be remiss if I didn’t throw out a “buy local” statement to this post. Small businesses support the communities that they are in. More money is poured back into the actual communities that they exist in. Independent retailers return more than three times as much money per dollar of sales than chain competitors. Independent hardware stores are hugely important to the fabric of our nation. Check out Independentwestand.org for more info. My daughter (26 with Dev. Delay) and I have done the Lowes Build and Grow clinics. We both have a great time and she is kind of learning to use a hammer without hitting Dad’s fingers too often. You can tell she feels a sense of accomplishment when we finish up a project. I love to see Noah and his brother. Noah is very special and adorable. I always look for the posts. Thank you so much for sharing. 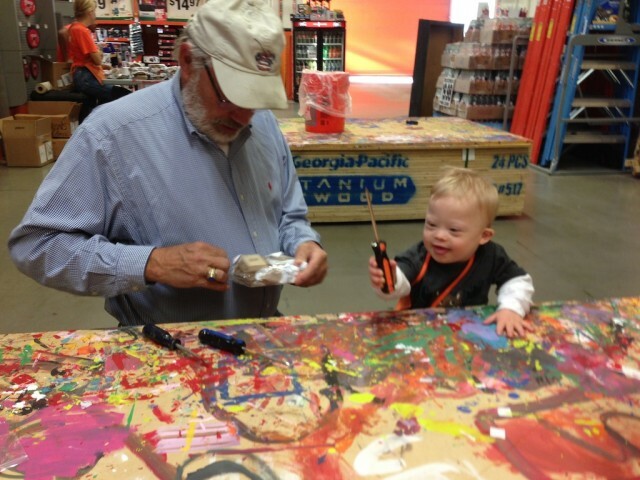 Great activity for Noah and Grandpa. A wonderful opportunity for practicing speech and language. Sorry to say we do not have a Home Depot in our town but watch the TV ads. Yay for time with grandpa! What a fun activity. I LOVE free activities with our kids. 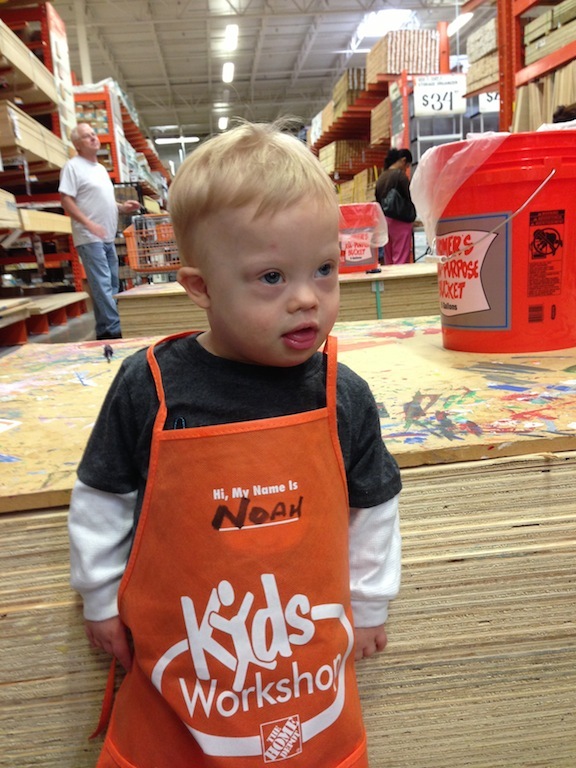 Noah looks great in his apron and looks like he had a great time. I enjoyed reading your post as always. Hi, I love his laugh…. 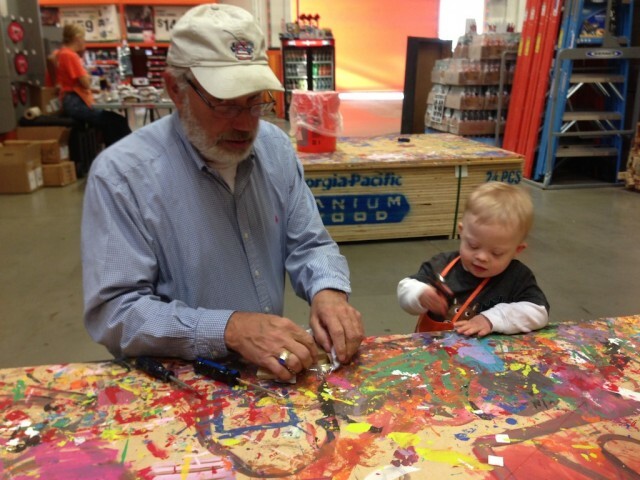 It is always fun when a Grandpa/Grandma and his/her grandkids do something special… The making of memories…. I love Noah’s apron…..
havent followed Noah for a few months. he is growing & looking more grown up, He is a handsome little boy! when my kids were younger, they loved going to the hardware store with their Dad,There were no free programs but lots to see & talk about. Obviously,Noah had a lot of fun with Granddad that day. What a precious boy! Thanks so much for your positive website; we have a son with T21, too, and he’s such a blessing to our big family! That looks like fun, we don’t have anything similar in the UK though 🙁 Noah looks more and more like you Rick! He is very cute with the chattering and giggling. Aww… cute! Love the pic. Hi Noah and the gang, I haven’t been over for a while but thought as it’s #DSAM2014 I would pop across the pond and say hi. This place looks great, and what a fabulous idea to open it up for free kids parties. What a precious little boy. I’m glad I found your site. I will look forward to seeing Noah growing up. He is so blessed to have parents that are trying to give him the best possible live he can have. The possibilities are endless. First of all let me tell you that I have fallen in love with your Noah! He reminds me of my 5 month old. I visited your blog while trying to look up material on down syndrome, since I my son has been diagnosed with DS. I know that early intervention and therapy is the key to their development, but would like to ask you how often and for how long should we do that. I have started going twice a week to the therapist recently and work on him at home for short periods (15 minutes twise daily) doing what the therapist asks. As the baby gets tired very easily, I do not feel like overexerting. But would be interested in knowing whats the recommended time. Since I am in India and we do not have too many DS related therapy/information in hand, this is the best way I can get some information and work on it. Noah looks like a charismatic young man. I’m glad I stumbled upon your blog to see heartwarming posts like these. Keep up the great work!